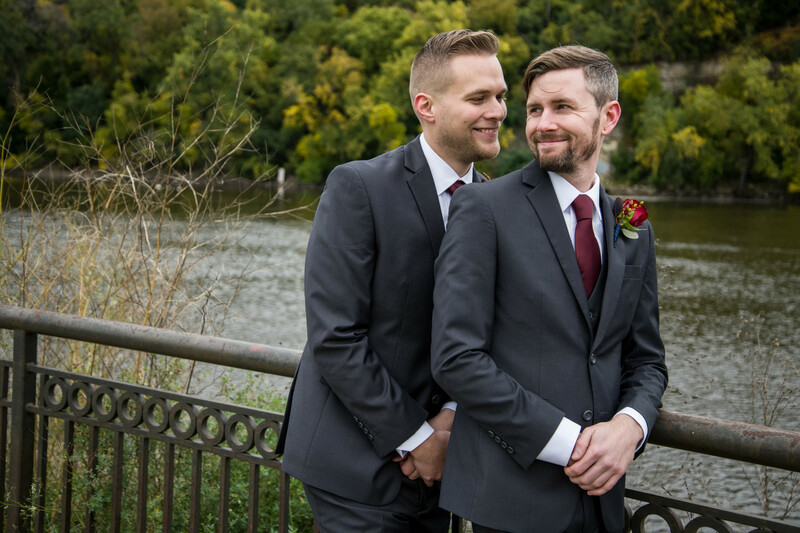 Michael and Darren were married on a very chilly day in October. Minnesota weather can be very tricky any time of the year and this was no exception. 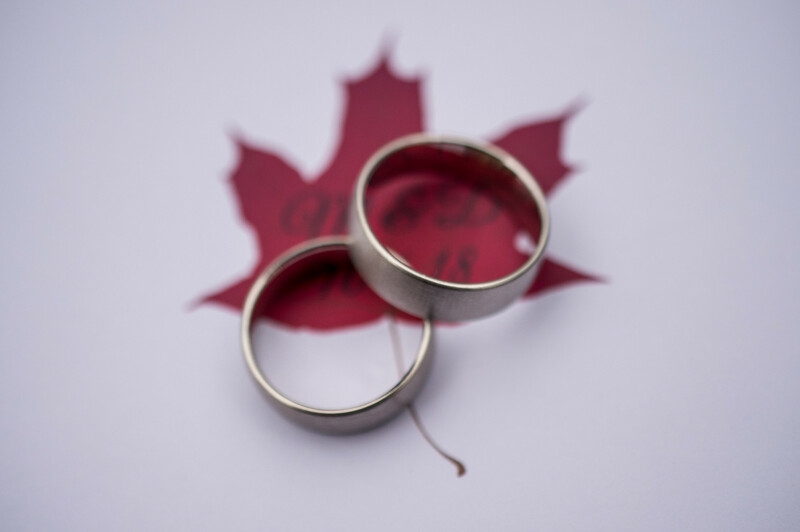 Q1: Tell us about your wedding! What was the inspiration behind your day? Did you have a specific theme, style or color palette? Did you incorporate any cultural or religious traditions in any part of your day? 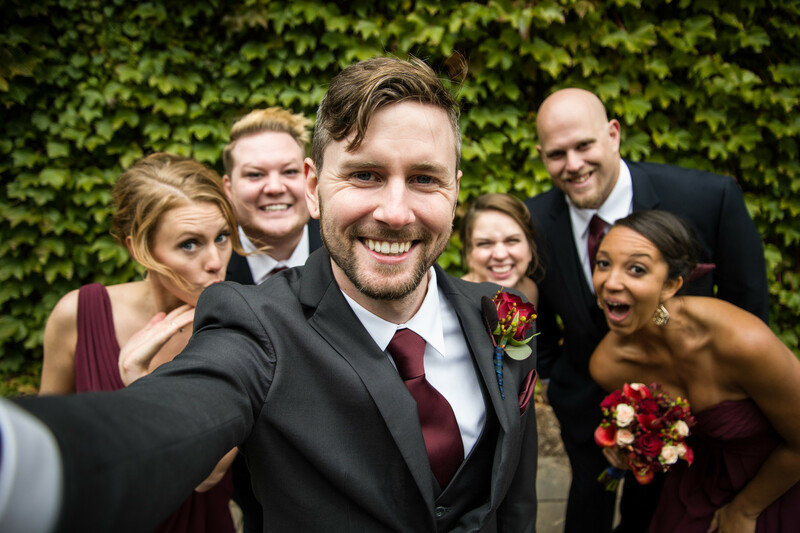 A1: After we got engaged we immediately decided we wanted a fall wedding. 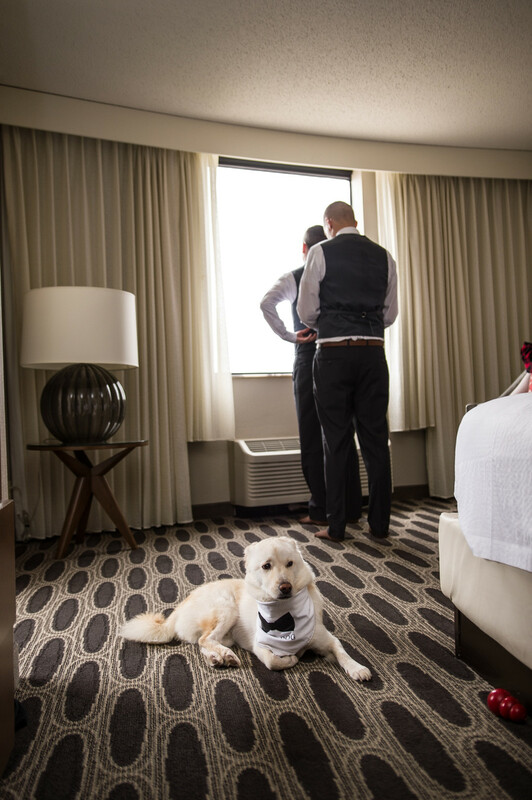 It was probably the easiest and most aligned decision we made about the whole wedding! I love October and Darren didn’t care as long as it was during the fall, so we went with it! We didn’t really have a specific style other than “We like fall leaves,” so we made sure to incorporate those everywhere. 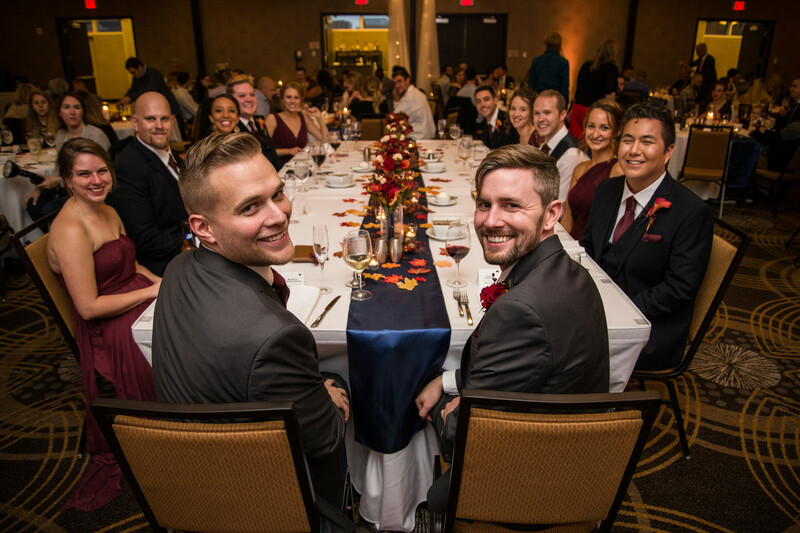 We used a “sweet fall” color palate, of while navy and burgundy/wine were the main colors. These colors were supported by standard fall colors such as orange, yellow, red, peach, and touches of brown. Q2: Let’s talk wedding decor. How did you decorate your space for the ceremony and the reception? Was any part of the decor DIY? 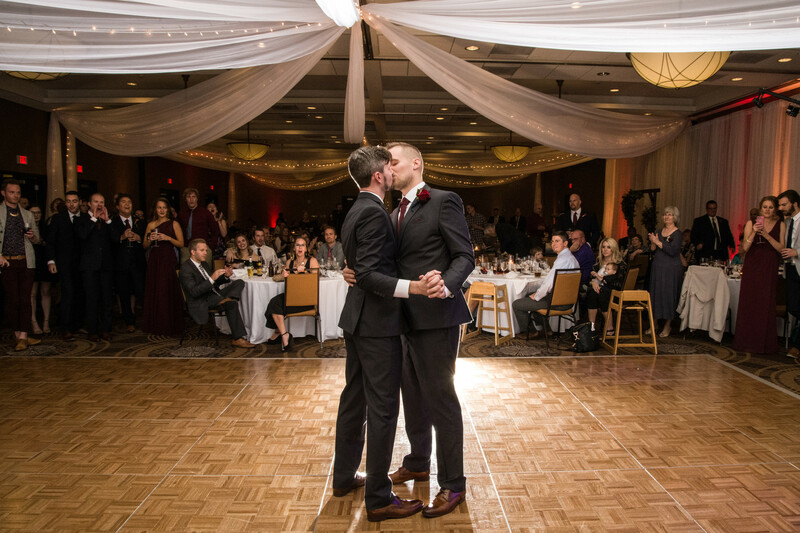 A2: The ceremony was in the hotel ballroom with wall and ceiling draping done by the venue that had white lights in them. The Best Woman’s fiance made the wooden arch for us, which we put flowers on, which were created by our florist. We had a unity candle ceremony and the candles had leaves in them, made by a shop out of California. One of our Groomswomen also made an “unplugged ceremony” sign for us.Our reception was all made from pieces that were purchased and put together. We aren’t very crafty, so that’s about as DIY as we got. 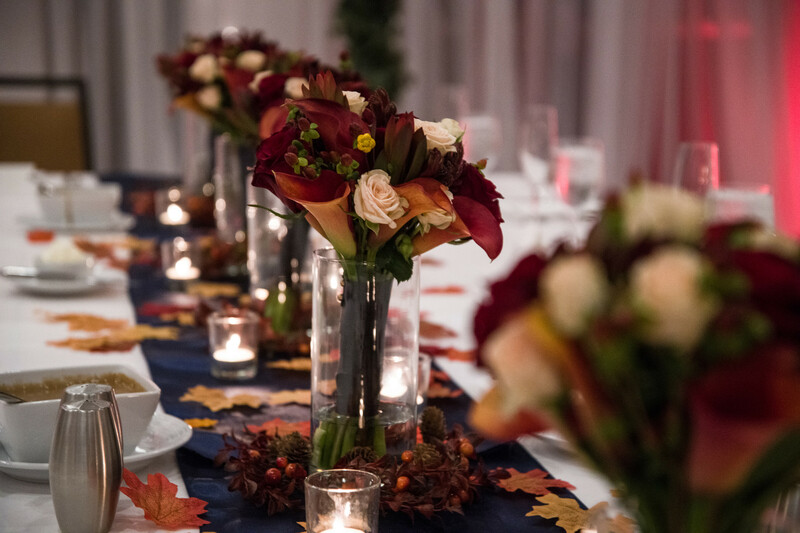 Our centerpieces were pillar candles in glass vases of varying sizes with brown and burgundy wreaths wrapped around them. 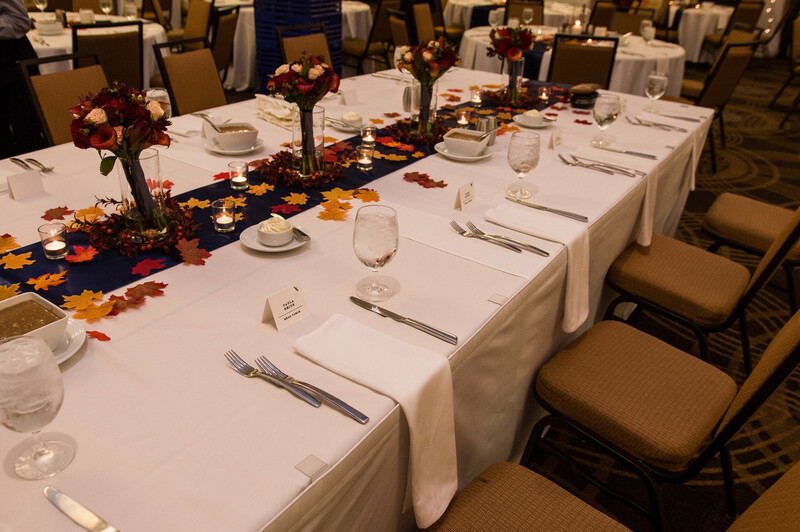 When then had a wide assortment of falls leaves sprinkled across the table, all on top of a navy table runner. The Best Woman/s fiance also made our wood table number signs, which matched our arch. The dessert table had glass vases of varying shapes and sizes filled with candy. There were navy and burgundy take away bags for the candy. 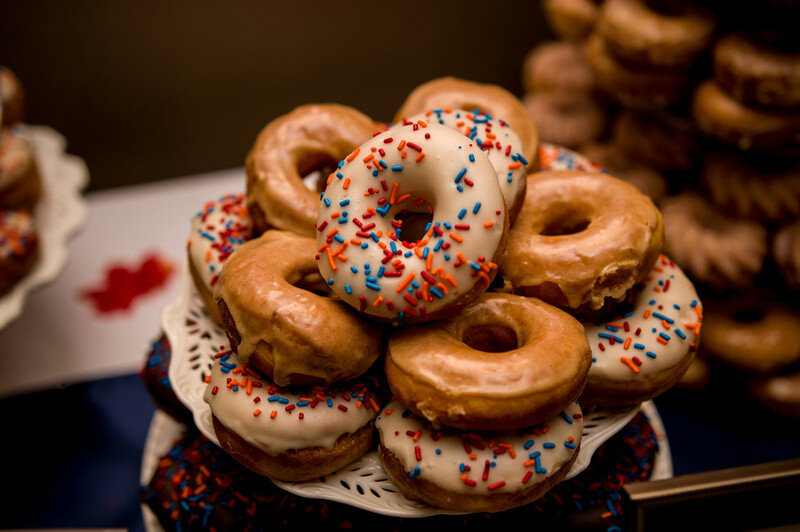 The donuts, provided by Glam Doll, had sprinkles that match our theme colors and were arranged and decorated by them. A Groomswoman made the flavor signage for the donut table so it would stick with our fall theme.The guestbook and memorial tables also had leaves on them, complete with pictures in dark wood frames to again match the rest of the wood in the space. Q3: What were the florals like in your wedding? Did you use flowers in any of your design elements like the bridal bouquets, centerpieces or ceremony backdrop? 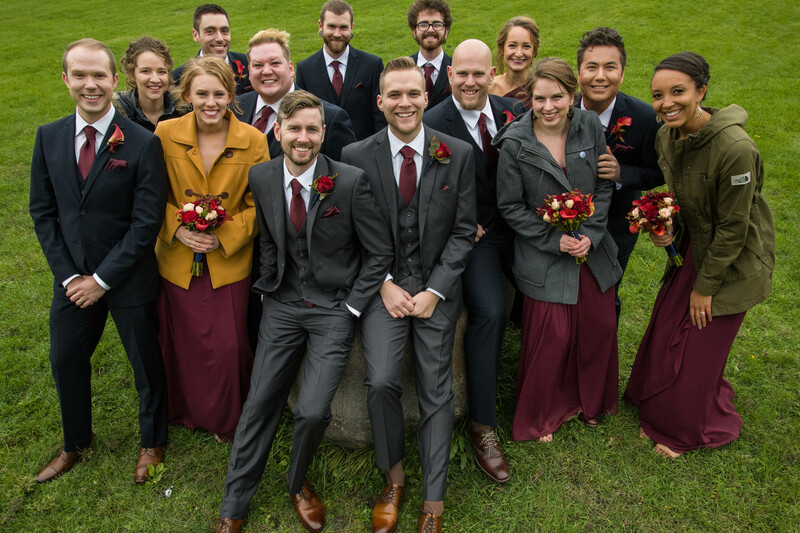 Did they play an important part in the overall style of your wedding? 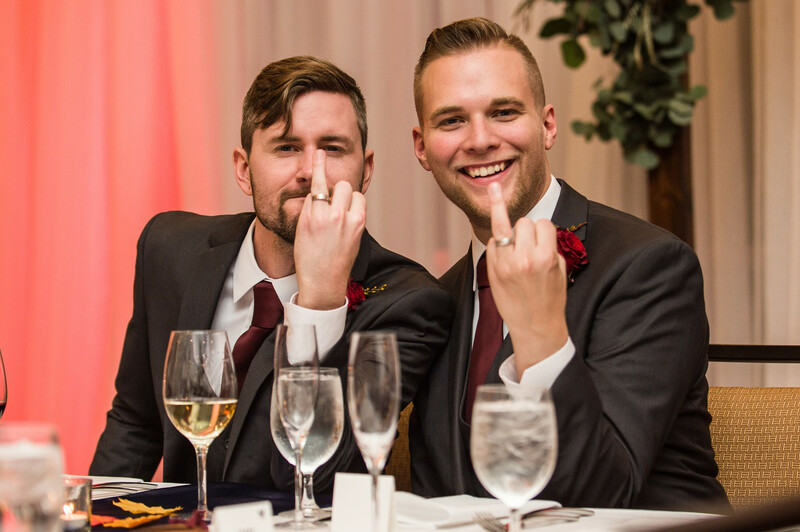 A3: The flowers we used played a more important part during the ceremony and not as much in the reception. Everyone in the wedding party either held flowers or had them pinned. Important family members either had them pinned or on their wrists. Our arch was covered in flowers that matched what the Groomswomen were holding. Q4: Did you personalize the day in any way (food trucks, guest entertainment etc.)? 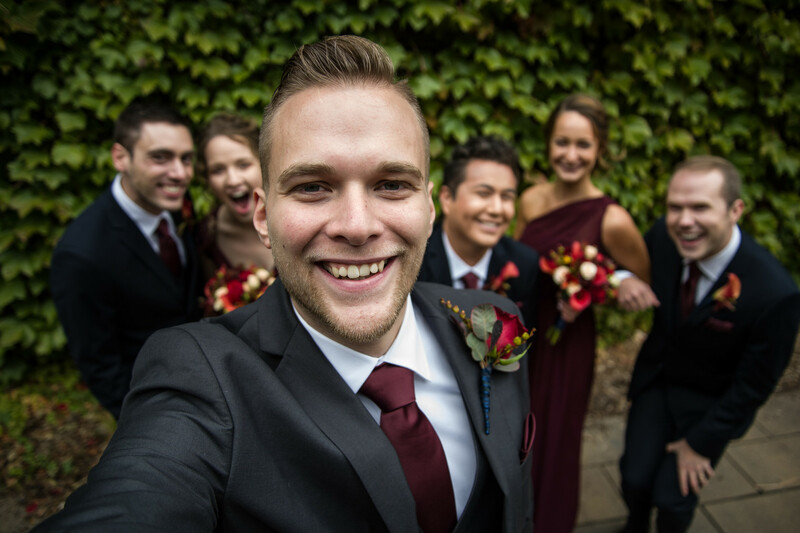 What were some of your favorite parts of your wedding? A4: The Glam Doll donuts were a huge personal choice. We really love them, so we had to have them. We also love pizza, which is why we chose to have that as our late night snack. The ceremony was somewhat created by us. 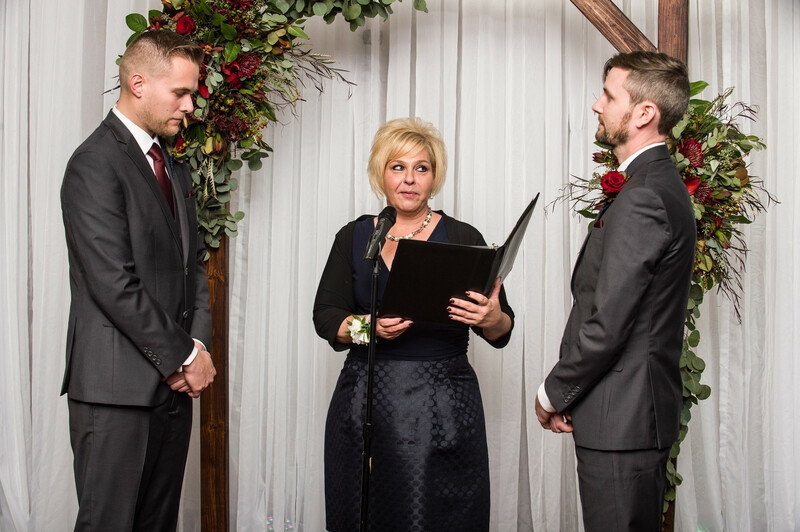 Our officiant sent us two different ceremonies and we more or else combined them and added in some other things to get to the exact type of ceremony we wanted to. 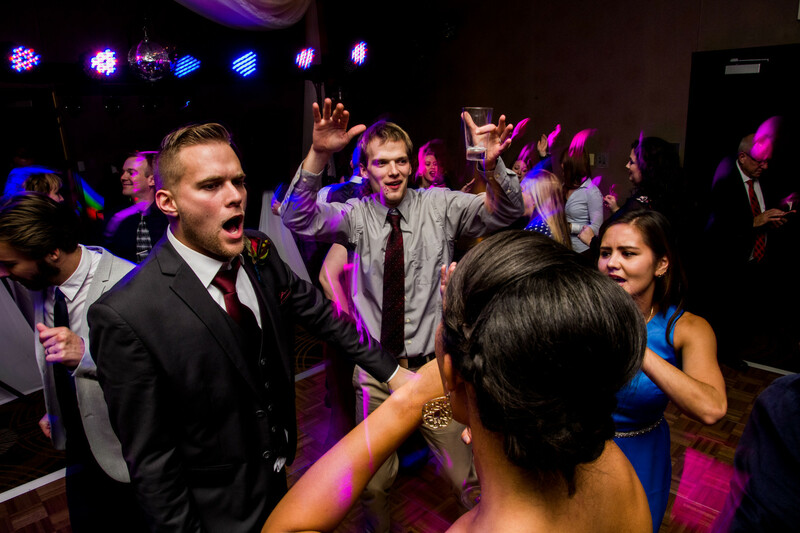 Our favorite part of the wedding (or than getting married) was the party at the end of it all. 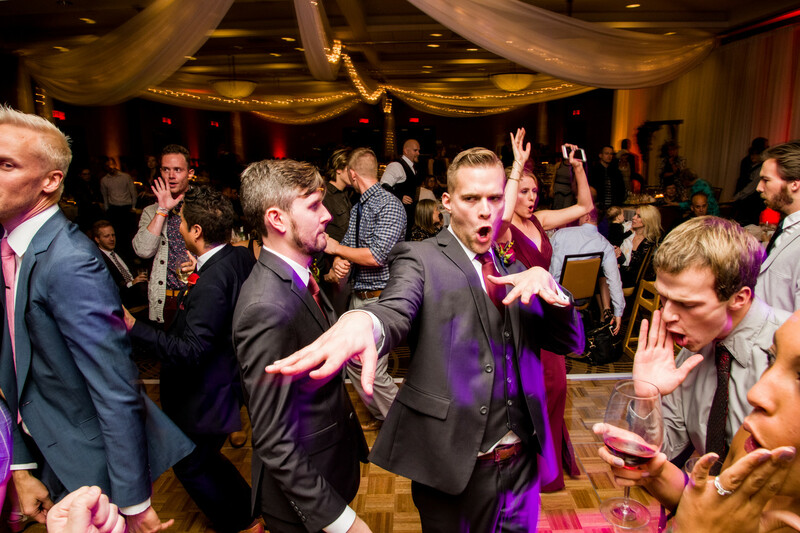 Being able to celebrate, dance, and laugh with everyone we hold so close was truly the perfect way to wrap up over a year and a half of planning. Q5: Let’s talk fashion. 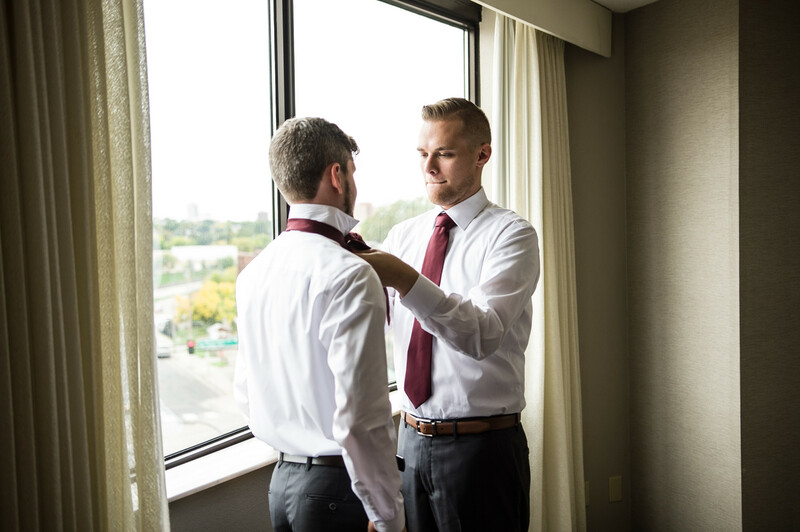 How did you both choose your wedding day look? Describe the looks in detail. 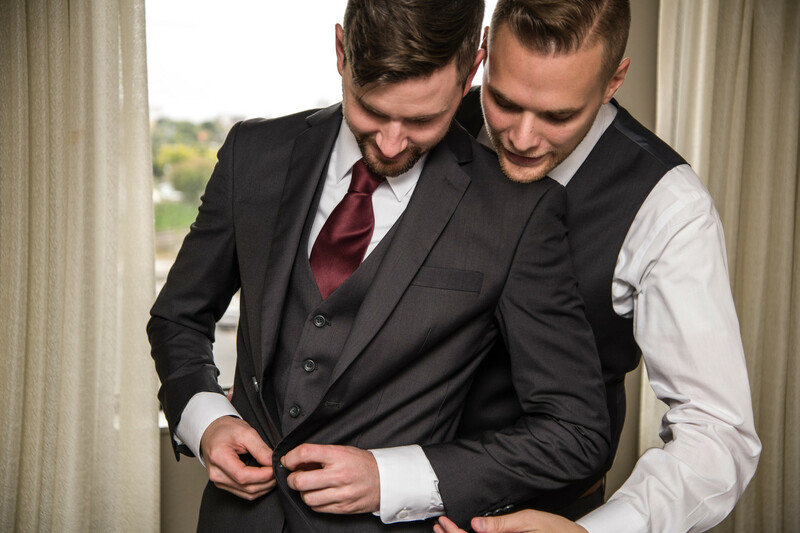 A5: We both knew we wanted to wear suits and we knew we wanted them to be dark, but not black, since it was going to be a fall wedding. We matched from head to toe. We had cognac shoes that got a little more brown at the tip, burgundy ties, and burgundy pocket squares. All of this was tied together with our dark gray suits, which also had dark gray vests. We both wore white shirts and brown belts. 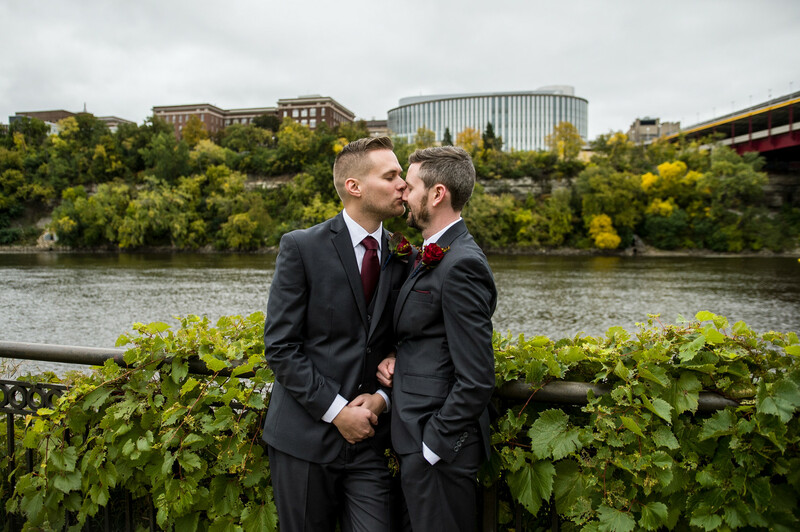 We had matching boutonnieres that were a single burgundy rose with fall foliage behind them. Q6: How did you meet? Tell us about the proposal. 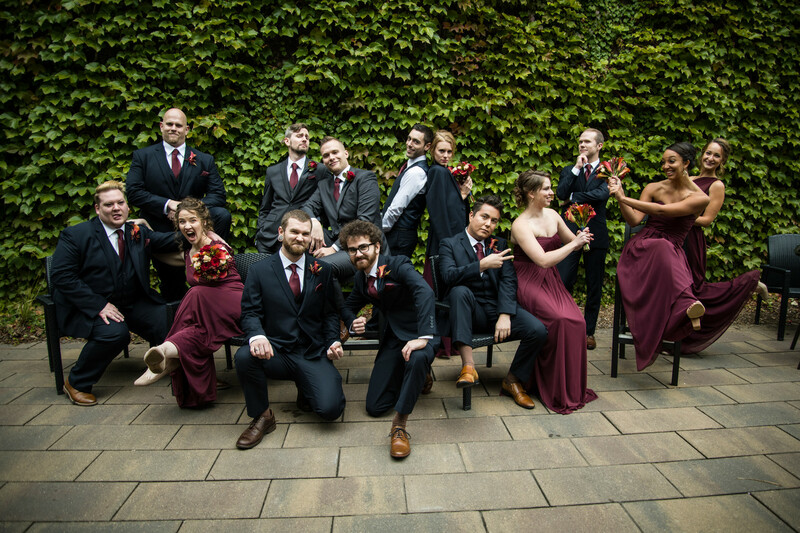 A6: We met at a party at the U of M and hit it off before the group left to go out to the club. That night we danced and talked for a while and the rest is history! The proposal happened in Central Park. I, Michael, had never been to NYC before and it’d always been a dream for me to visit. Once we booked our tickets, I knew I wanted to make it even more special and ask Darren to marry me there. I devised a plan to ask him while we had a picnic in Central Park. While we were eating I kept trying to talk down some pre-defined paths I’d thought out that would lead into me popping the question, but Darren kept batting them away, making it harder for me to segue into what I wanted to ask. Eventually I gave up and just got on a knee and asked him to marry me. He said yes and we kissed. After we kissed, I sat back down and noticed a woman walking toward us. She walked up to us crying and asked, “Did what I think happened really just happen? !” and we said yes and showed her Darren’s ring. She hugged us both and told us that love is precious and something to hold on to. She asked if she could take our picture, we said yes, but then she took out her phone to take our picture on it, which was surprising to us (we thought she was going to take one of us on our phone!). We did get a picture of us on our phone after she took it on hers though. Once pictures were done, she told us to, “Go infect the world with our love.” and that’s exactly what we plan to do each and every day we’re together. 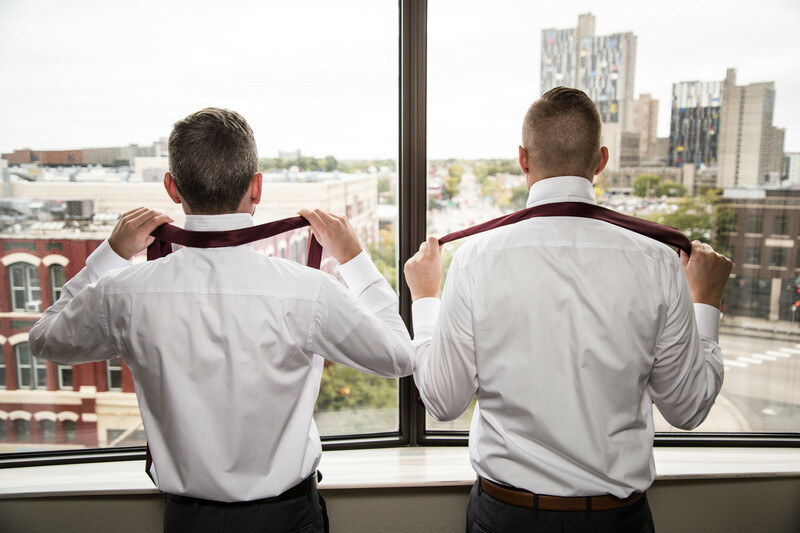 A7: The most anticipated moment of the day was turning the corner and walking down the aisle together. We’d spent a year and a half planning and answering many, many questions about our day and how the planning was going, etc. and it was all leading up to that exact moment. 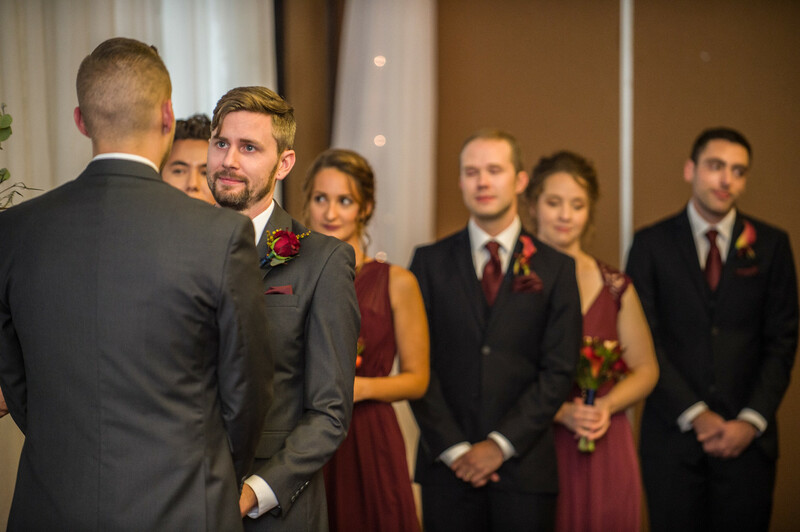 The moment we walked in in front of everyone we loved and headed down the aisle to start our future together. Q8: Do you have any wedding planning or marriage advice that you’d like to share with other couples planning their day? A8: When it comes to planning, it’s so important to soak it all in. It’s stressful and, yes, sometimes even annoying to have to deal with it all, but when it’s done it’s done and you will never have that experience again. Take it all in, enjoy it, don’t fight, laugh, and treat each other as equals. It’s important to make sure both people are represented on this big day.